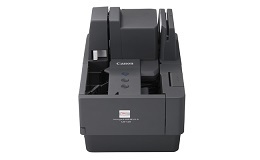 Enhance traditional check processing with the easy-to-operate, compact Canon imageFORMULA CR-120N check transport. With high-speed, high-quality, precise processing capabilities plus reliable item handling and now with direct network connectivity interface, the CR-120N check transport can help promote adaptability and productivity for financial applications. 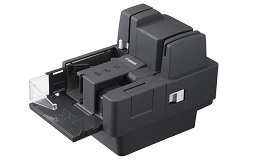 The CR-120N check transport can help assist in moving paper checks and related documents in front-counter teller settings, merchant/remote deposit capture (RDC) applications, and remittance processing, as well as higher-volume tasks such as back-office/branch settings, and lockbox applications. It enables users—in environments such as banks, credit unions, and retail—to improve their point-of-presentment applications by helping to automate funds deposits for quicker transaction times, decrease errors and fraud, improve customer service, and lower capital and processing costs. Scanning up to 120 items per minute with a 150-item Automatic Document Feeder (ADF), the CR-120N check transport can perform high-speed scanning for a wide range of document types, such as business and personal checks. It also includes a built-in ultrasonic sensor to help prevent misfeeds. To handle these, the cover of the CR-120N check transport can be opened, which also allows users access to the scanning glass and feed rollers for routine maintenance. The CR-120N check transport is equipped with features for efficient check processing. To help meet strict audit regulations, the built-in, five-line imprinter prints and captures endorsement information on checks. The CR-120N check transport is also modular and scalable, with functionality that can be added as required. With a dedicated card-scanner, users can scan plastic or embossed cards, and with the Magnetic Swipe Reader (MSR), users can also capture information from the magnetic stripe of a bank card. The CR-120N check transport also supports the most commonly used check scanning software, including the industry standard, Ranger Transport API. ADF Feeder Paper Size Min. - W x L 2.7 x 4.3 "
ADF Feeder Paper Size Max. - W x L 3.5 x 9.6 "